Setting up a website for your business can sometimes be a herculean task, especially if it is just a small business that is still struggling to pull all resources together to grow into a bigger one. You need to cut down most of your expenses and look for cheaper or free alternatives to everything that affects it. Resultantly, you may be looking at the possibility of getting a WordPress theme that can be integrated into your website to make it look professional without costing you an arm and a leg. If you are in a familiar situation, this article is exactly what you need. Since there are thousands of free WordPress themes available, you may have difficulty picking those that are best for your website. This article will provide you with 5 free wonderful, functional and professional WordPress themes that you can utilize for your website. These themes have been selected based on their functionality, customizability, professional displays and other essential features. If you need a business website that has elements for corporate and professional looks, do not look beyond Corporate WordPress theme. This bloat-free theme has been coded to have built-in features that display the homepage, portfolio and staff of any website in a corporate style. It is a free WordPress that allows great customization, so you can make your website to have a touch of your personal style. Whether you are building a personal or business website, you can always count on this exceptional theme. Due to the coding done by its experienced developers, setting up or operating Corporate theme does not demand the use of third-party plugins or shortcodes. Even if you want to personalize your homepage slider, this theme comes with custom post type that enables you to do so with so much ease. You can display the names, qualifications and other details of your employees, partners or teammates through this free theme. Also, the theme allows the addition of videos, images, and galleries that can help you display some of your previous projects. Another fantastic thing about this free WordPress theme is its blog. You can utilize the blog to share amazing articles with your readers and give them a few sets of information related to the services or products you are offering. You can also use the blog to share upcoming events or news that will be useful to the readers. All these extraordinary elements can be enjoyed via Corporate WordPress theme without paying a dime! Take your time to know more about this astounding theme and download it here. 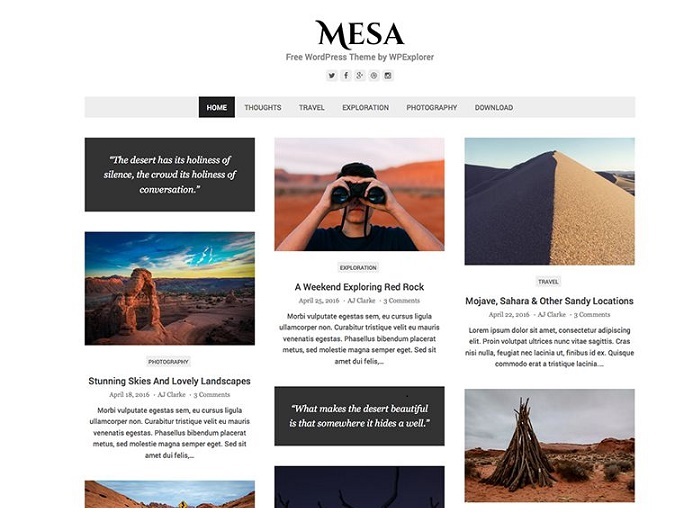 Developed by WPExplorer, Mesa is another free WordPress theme that comes with magnificent features that are best suitable for any blog. It can be simply described as a clean free blogging theme that affords everyone the right platform to start blogging and sharing their experiences with others. With the aid of its minimalistic designs, aesthetic masonry layout as well as custom Google font, you can showcase your writing skills and images with great and unmatched accuracy. As you are using this free WordPress theme to share wonderful texts, you can equally share captivating videos, images, audios, and quotes that your readers will be able to access with ease. Even if you need a gallery to display your contents, Mesa provides the right layout and design you need. To keep your homepage clean and content-focused, you can utilize the built-in reading settings of WordPress to determine the number of posts that will appear on a single page of the browser of your readers. Do you want to add your social links to your website? Utilize the built-in header social icons of Mesa to get this done and start sharing your contents on Facebook, Instagram, Twitter and other social media platforms. Mesa also allows you to add your custom logo to your website. 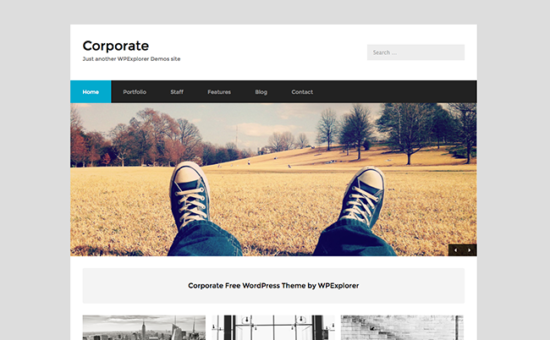 Would you like to get started by downloading this free WordPress theme? If yes, get Mesa now. For a one-page website that will give your readers detailed information at the first glance, Pixova Lite stands out among its counterparts. It is designed to be the perfect WordPress theme for any web developers. One of the major benefits of using this free WordPress theme is its adaptability to different screen sizes. The live editor of Pixova Lite enables users to customize different areas of the website. 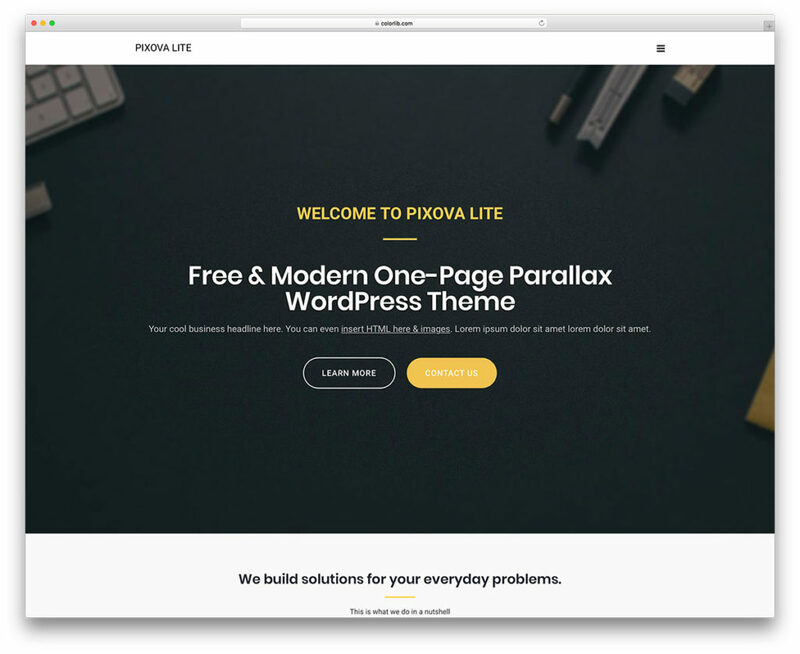 Pixova Lite has a Parallax header that allows you to add text as well as a call-to-action button that will stimulate your readers to start using your services or products. This retina-ready theme has a modern design that will make your website look completely different from the conventional websites most web developers are fond of using. Its image quality is second to none, so you can add images to showcase your previous projects. Although there is a premium version of this theme, this free version offers you everything you need to set up your website and start making sales. Download the Pixova Lite here. Developed by FancyThemes, Lightly is a stylish free theme that has various essential features that will take your website to the next level. As a free WordPress theme, Lightly allows you to develop a WordPress website easily without spending lots of money. This theme comes with a minimalist layout that will ensure that you can easily display your content in a manner that your reader can have an overview of your website without breaking a sweat. 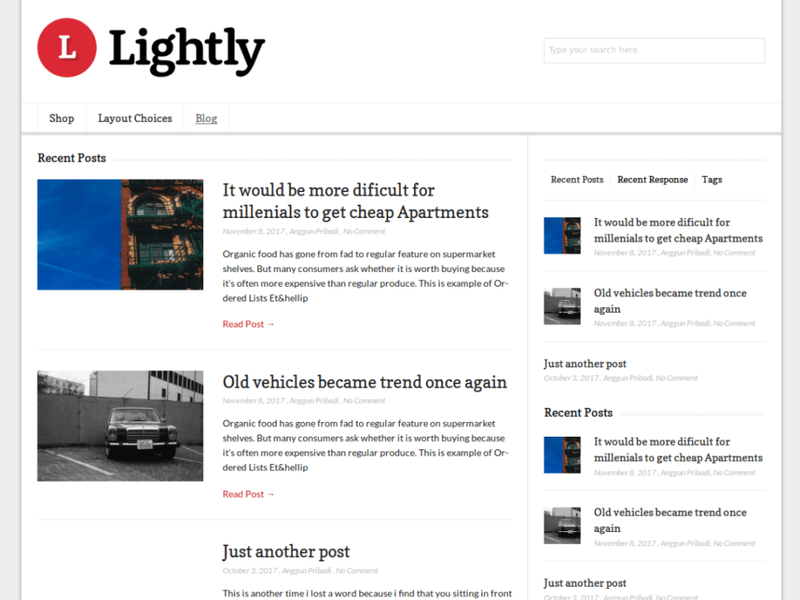 Lightly has been coded with a fully responsive grid; hence, you do not have to be worried about the devices that your readers are using because this free WordPress theme allows you to provide rich contents that are adapted to suit different devices. Also, it has been fully optimized to make sure its loading speed is top-notch with a page load of time of about 1.4s; therefore, readers can seamlessly and quickly browse your website. If you are particularly concerned about customization of your website, Lightly has got you fully covered. You have the option of tailoring the widgetized homepage as well as a fancy slider to suit your taste. This free WordPress theme also affords you the opportunity to add your custom logo and select the color of your choice. Furthermore, you can share your web contents on Facebook, Twitter, Instagram and other platforms by using Lightly’s social media buttons. Peradventure you are faced with challenges while using Lightly, you have access to a full localization support that will cater to your needs. There are regular updates that also add new and more exciting features to the theme. Download Lightly now and get the most out of your website. Without paying a dime, you can make use of the exceptional features of Education Hub to set up a website for colleges, online courses, universities, training centers and other related institutions. This free WordPress theme has been developed by WEN Themes to ease the process of establishing educational institutions. Whether for personal or commercial use, Education Hub can be customized to fit into your specific needs. As a modern and aesthetic WordPress theme, Education Hub comes with various options for customization. Its layouts are clean and content-focused with a highly responsive design that will improve the user experience. It comes with custom widgets, featured sliders, custom header images, and advanced theme options. While there is a paid version of this theme called Education Hub Pro, this free WordPress version offers you everything that your education website needs. 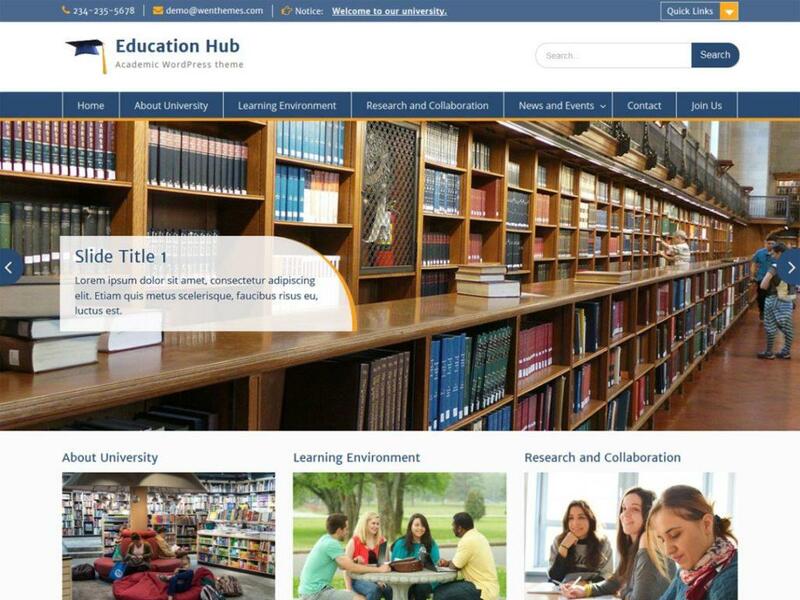 Optimize your educational website now with Education Hub.